Ganim approaches Henry Jemison for a signature. Image courtesy Mark Pazniokas, CT Mirror. Mayor Joe Ganim’s in high gear, with campaign team, hustling to secure more than 15,000 certified signatures from Democratic electors in Connecticut to forge an August primary for governor against Ned Lamont, the Ivy League millionaire who is self-funding his race. For the record, I had no problem with Ganim stopping in to woo signatures, nor any other politician for that matter. After all, we are a political site, let democracy soar and roar at our party event, “Welcome To The Jungle.” But for sure, it had people talking. Ganim has a way of eliciting grudging respect, even from detractors who marvel at his chutzpah. “Who does what he does?” noted another at the party, eyes roiling, head recoiling. Yup, that’s Joe, good, bad or ugly. 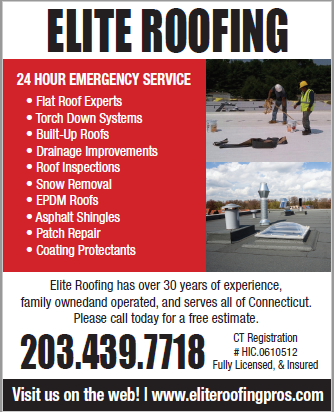 Ganim’s big ones are featured in three stories worthy of reading this Memorial weekend, from Mark Pazniokas of the Connecticut Mirror, Alice Lloyd of the Weekly Standard, the conservative opinion magazine, and Christine Stuart from Connecticut News Junkie. Jemison said he was happy to do it for Ganim, the only gubernatorial candidate he expects to meet on Park Street in 2018. He hugged Ganim, and the mayor of Bridgeport took his clipboard east down Park Street. “None of these people come into the city like this man,” Jemison said. 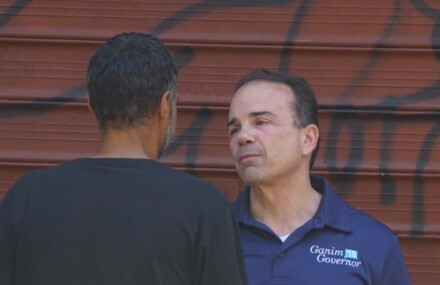 Ganim is focusing his petition drive in Hartford, Bridgeport, New Haven and Waterbury, places where a criminal record does not scandalize, where Ganim’s talk of getting a second chance resonates. He said he is paying staff $1 for every signature they collect. Evelyn Dukes was doing a good business, engaging the stream of pedestrians out in the heart of Hartford’s Puerto Rican community on a sunny spring day. Will the La-By mayo ticket campaign in the ‘hood like Ganim? Image courtesy New Haven Independent. 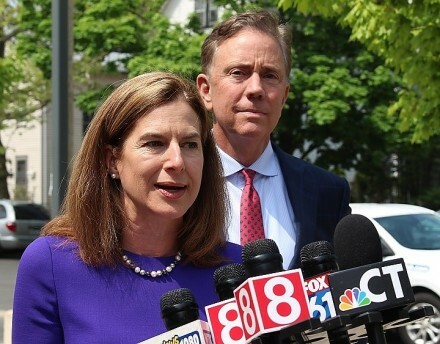 And now, in a tale of two Connecticuts, the mayor of Bridgeport, a convicted felon on a comeback tour, is running a longshot campaign in the Democratic gubernatorial primary against a millionaire businessman who went to Exeter and Harvard and has lived in Greenwich most of his life. Mayor Joe Ganim wants to take down Ned Lamont, the runaway favorite, who easily secured the endorsement of the state party convention last weekend. Lamont, 64-year-old heir to an early J. P. Morgan chairman, made his personal fortune in cable television and a name for himself stealing the Democratic nomination in 2006 from hawkish Senator Joe Lieberman, who then ran as an independent and won. The establishment candidate this time around, Lamont netted nearly 87 percent of the floor vote at the Democratic convention in Hartford on Saturday, May 19, ceding the slim remainder–half of them from the state’s depressed post-industrial cities–to his one unrelenting opponent. Lamont campaign staffers told me they believed Ganim might drop out as soon as Monday. Ganim staffers said I must have garbled the quotation. “If they think that, they definitely don’t know Joe,” said Ganim campaign coordinator Troy Jackson as he hurried from the convention center after Saturday’s vote, off to knock on more doors in New Haven. “A whole bunch of people got together and they didn’t want me to run,” Bridgeport Mayor Joe Ganim explains to a group of men hanging out on Park Street. It was a pitch to get them to sign his petition. Ganim needs 15,458 signatures from registered Democratic voters in order to qualify for the Democratic primary on August 14. Last weekend, he failed to get the 15 percent of the delegates he needed to automatically get on the ballot. Next Post:OIB Poll: Should Ganim Primary Or Support Lamont? John G. Rowland, the disgraced former third-term governor whose 2004 federal corruption conviction led to the state’s landmark public-financing program, turned 61 on Thursday. But more importantly for the former titular head of the state Republican Party, his latest federal incarceration comes to an end Sunday, when he is scheduled to be freed from a Waterbury halfway house, according to the Federal Bureau of Prisons. He is expected to immediately begin circulating petitions for Joe Ganim candidate for Governor. “Us second chance candidates need to stick together” Rowland said. At least it wasn’t a Hung Jury! I don’t think so. It’s all-out war. My wife and I signed the petition. of Democrats be the only ones to decide who runs? There were almost 2000 Delegates at the State Dem Convention. In the USA we have representative government and so does the Democratic party. Every REGISTERED Democrat can vote for Town Committee members and Town Committees choose the delegates to the State Convention. Any registered Democrat can circulate petitions to get non-endorsed candidates on the primary ballot. I don’t support Ganim, but belive he has the right to gather signatures and forve a primary. Once again,we must remember decisions that Mayor Joe Ganim made. Ganim has continuously proposed flat-lining BBOE budgets creating actual budget shortfalls. 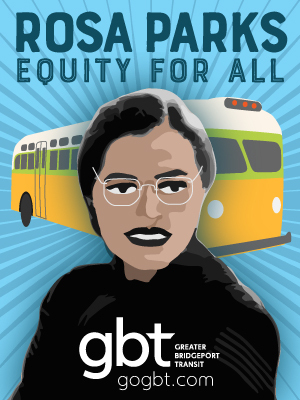 Ganim decided to throw Bridgeport schoolchildren “under the bus.” I wonder how that would play in the rest of Connecticut? Did anyone overhear Ganim saying that as he scoured for signatures? The only time Ganim goes into the ‘hood is when it’s set up as a PR event. 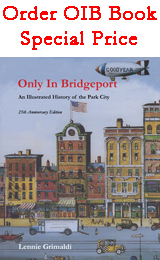 BTW,Congratulations to you,Lennie,and all the other post=ers on OIB for this forum known as “Only In Bridgeport.” Not only is relevant to Bridgeport but statewide as well. Quite an accomplishment! I’m not out to crack you up, but rather to question you on the phrases “nerdy Ned” and “lunch bucket Joe. I am relatively uninformed on Lamont. Have some sense that he may have started life in something other than a log cabin. In baseball terminology was he on base at birth, ready to advance home easily, perhaps? But it sounds like he went into a modern business and made some serious money that allows him to self fund a campaign. What I am interested in is knowing how he will approach stabilizing and sustaining our ship of state? Love to read some real words towards that end. Relative to Ganim2 we know that he may be comfortable in Easton but he also never lived in a log cabin. Why not give up “lunch bucket” description? He is not a blue collar, union member, man of the people. He had 15 years of education at fine schools, but still required Federal funding of an additional “seven years” though he is not really eloquent about his courses and grades during these post-grad sessions. During his first time as Mayor didn’t he collect fine wines and clothing? Are those “lunch bucket” menu items these days? And many folks in the State have transportation problems, but not Joe Ganim. Wasn’t Joe threatened by another Bridgeport “second chance” citizen whom I have come to know? Did that person utter some intemperate words and suddenly Joe needed protection and a driver paid for by the voters? Chauffeurs and lunch buckets are equally strange to my way of looking at the world. More strange is that the person who caused Joe concern for his physical safety is now a DTC member and soliciting signatures for Ganim2? What is Joe afraid of these days? What a strange world in which we live? Time will tell. I agree with JML – there is no need to add adjectives to any candidates name – or is Lenny trying to emulate Donald Trump!!!! And you are showing your bias between the two candidates. Run Joe Run – but please tell us what have you accomplished upon your return to office besides reinstating your pension and running for Governor on our nickel? Whys is that allowed anyway? Joe you need signatures? Send someone to the Golden Hill Court,plenty of support. Then another person to DSS, put them where the free phones are. Finally there are two methadone clinics, between these four you would have signatures to spare. You have some familiarity with places where those who are having significant problems currently? Courts generally are established to gain the attention of those caught for breaking rules because of poor choices often, and methadone dispensaries have been available for over 50 years as a method to allow addictive persons to get normal in the rest of their daily activities while dealing with the ‘hunger’. Whatever on DSS, but surely you are not suggesting that these locales are the places where registered Democrats are found? As in, do Republicans make poor life choices as human beings? The real question for most people who are looking for a re-start to their life situation, is, how do I do this? Is Joe a model to follow? Is the problem that he does not say what is really on his mind….his own advantage…because that is not exactly “politic”? But doesn’t Joe know that when you get a “second chance”, squander it, and genuinely ignore those without privilege, advantage and status, whatever steely respect might have been there for fighting the system, turns to rust. Corrode? Or corrupt? Does not bear the weight of community need that leadership should attend to. Time will tell. Joe Ganim is running as the Second Chance Kid. From now on I’ll refer to him as SCK. He just wants to get out of Bport. Charlie may have been disrespectful to SCK but if he wants to concentrate on that population and not the rest of CT well Charlie is is just making helpful suggestions. PS The SCK knows there are not a lot of white collar criminals on the streers of Bport. Joe received his ‘second chance’ already, when he won the City election against Foster and Finch forces. What has he done with it for Bridgeport? Please…..do not go silent on us now, Steve…..Auerbach got hired to sing his praises. So that is what is called a “second chance”. Or is it merely “sycophance”? What is a crime is that Ganim2 has been no role model for a “do over”, turnaround, or second chance (after blowing his first chance). What are others with less support to do? Who cares about them? This cat didn’t change his spots, did he? Time will tell. It’s all about the clipboards. Ganim is serious while Bob Walsh uses it as a prop at the zoo. The streets of Hartford, New Haven and Waterbury are full of clipboards chasing signatures. Too bad you’ll be feeding the kangaroos! The ultimate loser trait isn’t being wrong, it’s not trying at all! Nobody would ever accuse the Mayor of that. He’s got an ego the size of a battleship and the cashews to prove it.